At times, however, its role as a shaper of national opinion was somewhat confused. Its first editor, TC Harrington, had a unique way of formulating editorial policy. His role, according to contributor Felix M Larkin, was to follow public opinion as he perceived it and articulate positions broadly acceptable to his predominantly middle-class Catholic readers, so as not to lose their custom. …Few things ever change significantly at the heart of newspapers. Resonances of today’s strident debates over proprietary interference with editors are echoed in the conflict between [William Martin] Murphy and Harrington. And it is Harrington who had the last word, after Murphy had requested him to support a friend in a by-election. 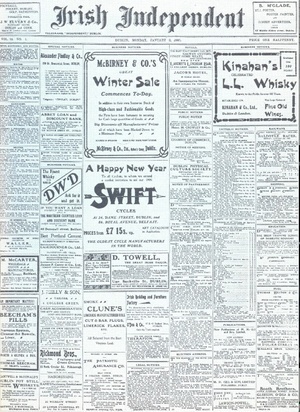 Harrington rose to his full editorial height and thundered at Murphy by letter that he was seeking reassurances “that I will be given a free hand as regards the policy of the Independent on political questions and matters and that you will not persist in forcing your unpopular political views on me with a view to getting them into the editorial columns of the Independent”. A “Strain On Patriotism” Kill It With Ire MAN GOES TO SHOP, BUYS STUFF Did The Editor Have His Points Quashed? Posted in Misc and tagged Irish Independent at 12:06 pm on September 24, 2012 by John 'Preposterous' Ryan.